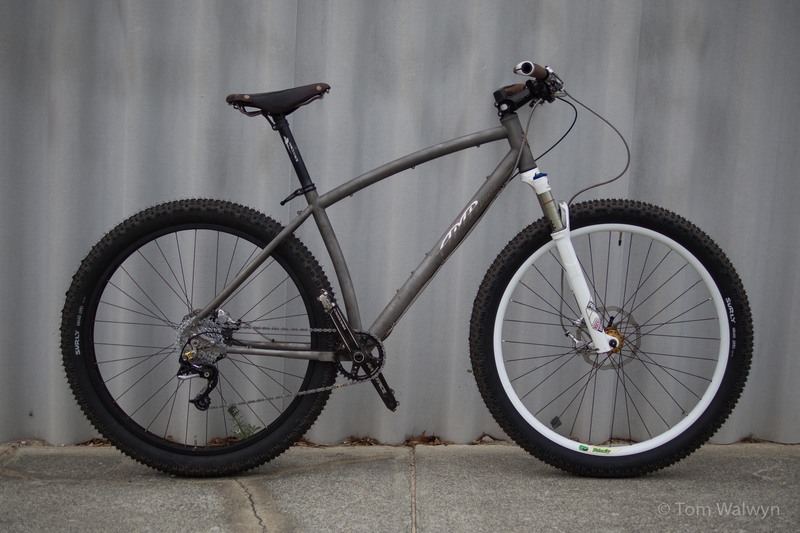 The other main iteration of this AMPeirce: 29+ hardtail. While I find riding our local mountain bike trails surprisingly good in ‘full fat’, this guise is that bit better. Especially when it comes to moving faster over things rocky. Yesterday was a maiden ride out at Kalamunda, with some time to learn tyre pressures and adjust gears while enjoying a lighter, nippier response allowed by the lighter set-up (no Rohloff). So much fun that no photos were taken, so some shots from this morning to illustrate instead. This is the lighter, faster trail machine. The Reba 29 RLT fork is set for 100mm travel which lifts the front end a touch compared to the rigid fork. I have the option to lower it to 80mm, but the ride didn’t suffer for the longer travel. The standover in this mode is as high as fits me – but not too high. The bars are different for a wider, more climbing friendly control. 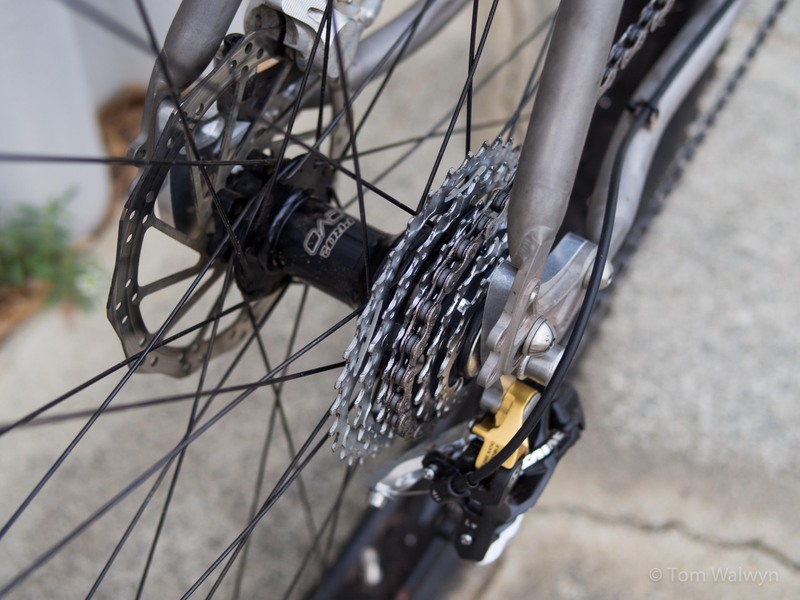 The crank/chainring are the same, but the drop-outs are swung to their inner most position. Still enough chainstay clearance and the cable routing across the ‘plate’ works a treat. Some modification has been needed to allow the 29×3.0″ Surly Knard tyre to fit through the fork arch unhindered. This rim gives a taller, but narrower profile over the other options. I’ll likely take some more off the sides as there was a bit of rub on aggressive cornering. I’ve also beefed up the axle to stiffen things in compensation. Other forks give a similar effect without losing metal. This Hope SS/Trials hub with bolt-through axle is much lighter than the fat-Rohloff and stiffens the rear end too. Although singlespeed is possible, I’ve allowed my knees the luxury of some gears. This selection cover the range I need pretty well, but does force me to free-wheel (loudly) on the fastest downhill stretches. Hi Tom, nice! I assume that’s 10 speed spacing? Any issues with chain drop off the front ring? For what it’s worth, my AMPeirce was designed for an 80 mm fork with a 70.5 degree head angle, I chained the fork to 100 mm and actually like the handling better. 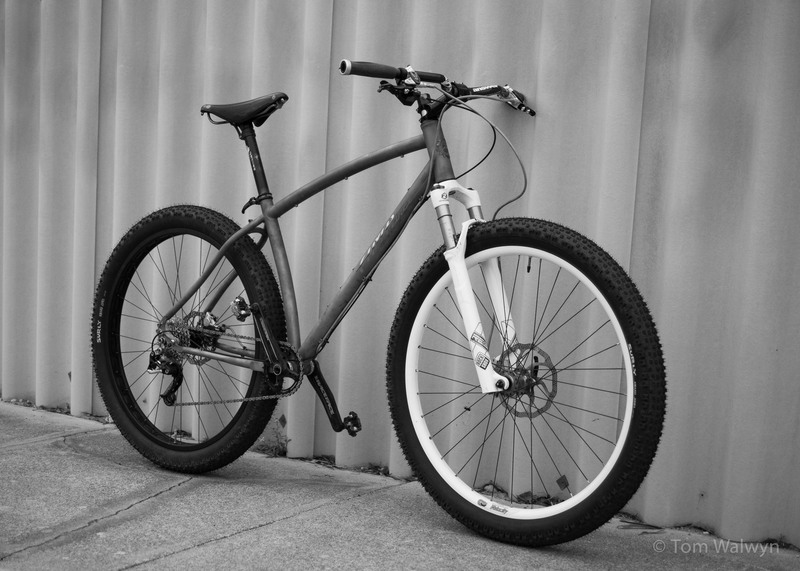 Do you know, can this bike accept the SRAM 2×10 mountain group set? 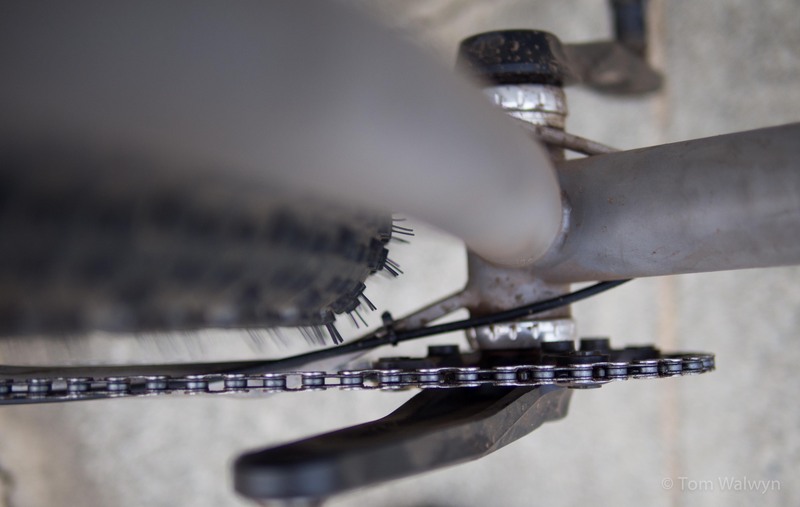 Glen – it won’t in ‘fat’ mode and I’ll check for 29+ – the chain stays are shorter than a Krampus (435mm I think). I have a hope SS hub out back so can’t try it at the moment. 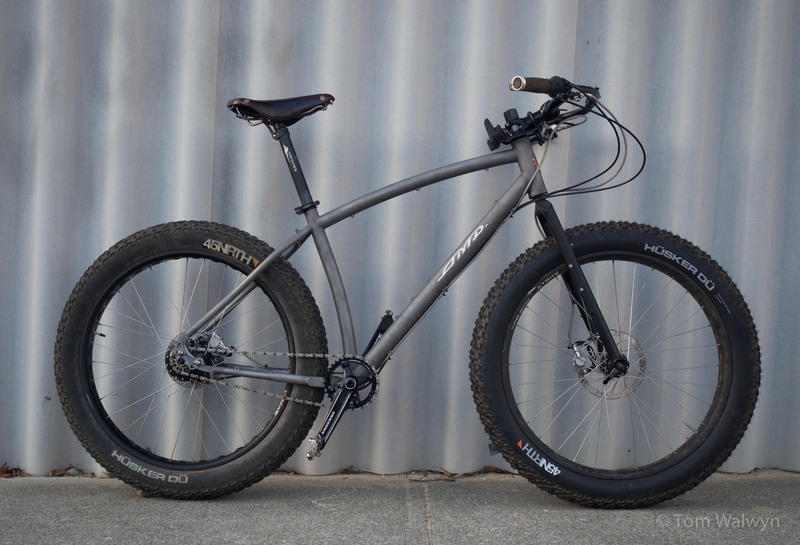 Will report back when I can – maybe the comparison w a Surly Krampus is enough for you to be able to extrapolate? Thanks very much. I’ll look at the Krampus build… Iam leaning toward a Rolhoff hub in any event, but very much like the 2×10 setup on the Mukluk. Just not sure about Rolhoff gearing for trails and climbing etc, as small increments seem to make a difference,and really haven’t much experience with Rolhoff other than one demo ride on a street bike. I emailed Peirce but haven’t heard back. Maybe will try to call him and discuss a possible 2×10 mod. I find my Rohloff fine for trail riding and climbs – it has advantages in that you can pick the correct gear for the next section while freewheeling the last. You’re also never caught in the wrong gear if you stop unexpectedly. With a 73mm BB and the 4″ fat tyres on the Peirce the only possible setup is a Rohloff as even other IGHs don’t have a wide enough chainline. I know he has a 2x setup on his copy of this bike for 29/29+, so it works there – just not (in this guise) for fat. You may have more options if you go for a wider BB and a 170mm rear rather than the 135mm I have. 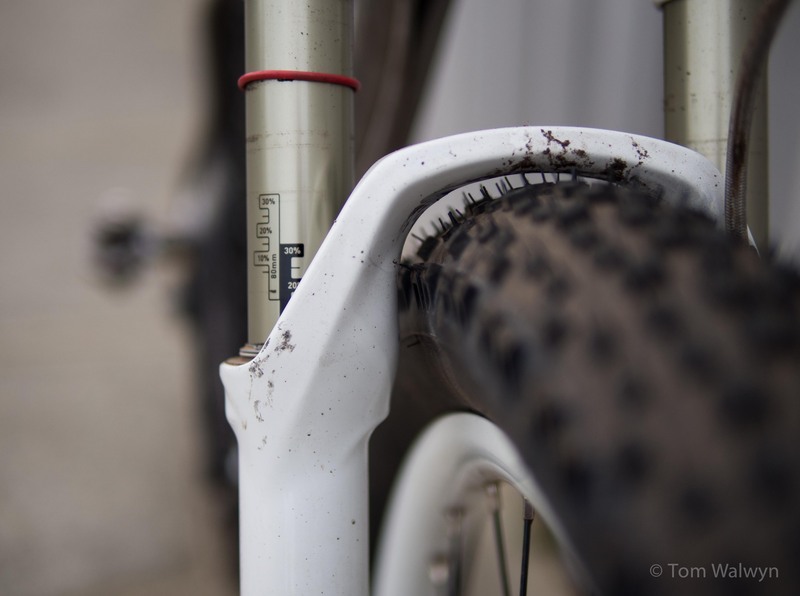 cool, i like this – im thinking of running a 3 inch rocket ron tyre in a DT Swiss 29 cross country race fork but on a 27.5 inch wheel possibly on a 30mm rim. i was wondering what modification did you need to make for the front wheel to fit? was it because the tyre was hitting the wheel arch? or the sides or both? my configuration will come out to about 715mm wheel / tyre diameter, which is about 28.2 inches. what tyre pressure do you run on this?